Tired of the same old dinner party or special event themes? Why not try a theme that has worked since the dawn of civilization… A Beer Dinner! As the world’s oldest recipe; beer has been served by hosts throughout history to enhance the dining experiences their family and friends. The tradition of carefully crafting beer flavours in the brewery is almost as old and complex as the tradition of skillfully combining flavours in the kitchen, and it’s high time we brought these two ancient art forms together in a more meaningful and delicious way. We’ve always savoured breaking bread together, but this event takes food and drink to a new “Eureka” level. Learn a little about what you’re tasting, explore flavour combinations that wake up your palate, and experience how friendly guidance and tales from the past can change the way you enjoy both food and beer. The Eureka Beer Guide will work with you or your chef to choose the best matches for your dinner courses, while also providing your guests with just the right amount of information to “evolve” their beer experience. 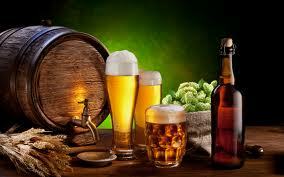 Eureka Beer Guide can host these events in a licensed premise, corporate office or in a private home. Contact us at ken@eurekabeerguide.com for more information or to book an event like this for your group! Educate, explore, experience – it’s the recipe for Eureka!